When you ask parents to name the worst word that anyone could use to describe their child, a lot of them give the same answer, according to personal finance columnist Ron Lieber. “A surprising number of them answer right away with the word spoiled,” Lieber writes. I’m not surprised. No one wants a toddler who throws tantrums whenever they don’t get their way, or a teenager who doesn’t appreciate what they’ve been given. And, as Lieber points out in his book, “The Opposite of Spoiled,” there’s a culpability at the root of this fear. Are you a parent who wants your kids to be money-smart — but not spoiled? Not only is Lieber an author, speaker and the New York Times “Your Money” columnist, he’s the father to two daughters — a 10-year-old and a 10-month-old. 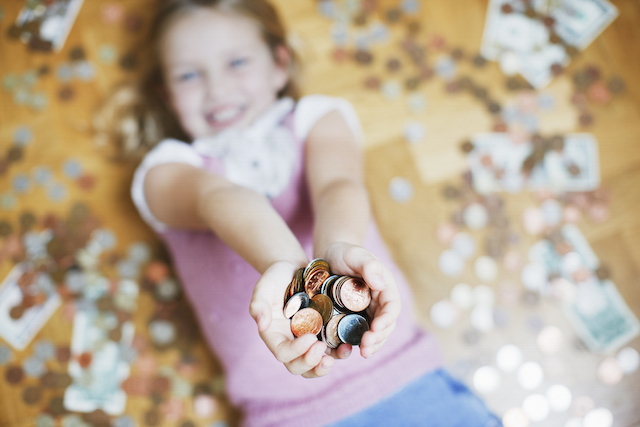 When his older daughter started asking tough questions about money seven years ago, he realized how “crucial” it is to discuss finances with your kids — and that no one really knows how to approach teaching kids about money. So he talked to families and scientists across the country, and wrote a book called “The Opposite of Spoiled.” Though it’s targeted at families with household incomes of $50,000 or more, the advice rings true for any parent. After all, being spoiled doesn’t necessarily correlate with how much money you have. Note only the last one is associated with money. No matter how much money their parents earn, understanding personal finance is essential for all kids — both now and in the future. So you want your kids to be generous and financially savvy — and hopefully avoid the same mistakes you made? Kids are going to ask tough questions. And once you find it, he writes, the question becomes much easier to address. If it’s the result of idle lunch table talk, you can simply redirect the conversation. If it stems from anxiety, often some reassurance — rather than hard-hitting truths and numbers — is all they need. I’m not gonna lie: This is one of the things that scares me most about having kids. Since it’s hard to say “no” to your children, Lieber suggests explaining your decision in terms of wants and needs. When he says “no” to his older daughter, he tells her it’s a “want” and “more than we’re willing to spend.” Then he lets her know she can save up for it if she decides it’s a “need” for her. Down the road, I think I’ll print that out and stick it in my wallet. How can a 10-year-old save for a purchase? With her allowance. For example, you could start your 6-year-old on $3 a week, and ask her to distribute her “paycheck” evenly between her jars. Lieber believes in allowances — so kids can get practice “thinking and counting” and determining which goals are “extravagant” versus “worthwhile” — but he says you shouldn’t tie them to chores. Why? Because “it puts you in a bad negotiating position,” he explains. What if your kid saves up enough money and decides they’re not doing chores anymore? I still remember one really dumb financial choice I made as a child. Although I was filled with remorse at the time, I’m glad it happened; $7 was a small price to pay for a lifetime of frugality. Lieber agrees that regret — even if it’s “searing” at the time — is one of the best ways to learn about money. How on earth can you teach your kids about the value of certain items when they don’t yet understand money and prices? Try using the concept of “hours of fun per dollar,” a strategy Lieber learned from some of his readers. When you’re at the toy store, ask your kids how many hours of fun they’ll have with a certain toy before they’ll tire of it — and then use that to determine if it’s worth the price. Make your kid get a job. Of course, Lieber acknowledges, helping support the family isn’t a choice for some — but if it is for your teen, you should still encourage them to work outside the house. “There’s all sorts of research out there that shows that as long as you’re not doing more than about 15 hours of paid work during the week, it shouldn’t affect your grades,” he says. What’s the biggest financial mistake parents make? “Signing up for a bigger tuition bill and more debt than we can afford,” says Lieber. When your kids are staring at you with their “watery, googly eyes,” he acknowledges it’s extremely difficult to say no. Don’t co-sign for any loans either. I asked Lieber what one thing he hopes his daughter knows when she leaves home — and I absolutely loved his response. “The best thing you can do is to know yourself and understand which ways of spending money will make you happiest,” he says. Now that is a lesson we could all learn. Your Turn: Many thanks to Ron Lieber for sharing his advice with us! What’s your favorite tip from this interview?